Mayer Masonry & Stucco, Inc. Comment: exterior vinyl siding melted by fire from adjacent building. would like to replace vinyl with wood or fiber cement. 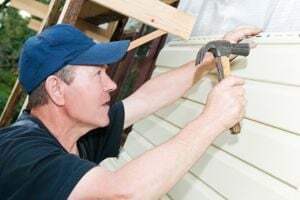 Comment: Replace a sheet of siding on the upper portion of a two story addition. It can be reached by standing on the adjoining first floor roof. Replace the strip on the bottom also. Comment: I need an estimate on I need skirting installed on a mobile home. De Leon Springs Siding Contractors are rated 4.65 out of 5 based on 268 reviews of 9 pros. Not Looking for Siding Contractors in De Leon Springs, FL?